• House tours will accommodate a maximum of 20 students at a time. Groups of 60 will be split into 3 groups. Teachers should plan an alternate activity for groups waiting outside while house tours are currently in progress with the group on a tour. • Writing tools and clipboards are encouraged, but will not be allowed into the Ranch House. • Please note that there must be a ratio of 1 adult for every 7 students. Schools are responsible for the behavior of their students. Close supervision is required of group leaders. • We ask teachers to prepare their students on the background of Will Rogers: a good source of information is this website. It is also recommended that students do some kind of school project based on their visit, such as group reports, drawings or writing projects, etc. • Reservations for picnic tables must be made in advance by calling (310) 454-8212 x 101. • School bus or vehicle parking fees are waived for school groups with reservations only. School groups without a reservation will be expected to pay all fees. Ranch House tours are a popular feature and are available for school groups by reservation only. 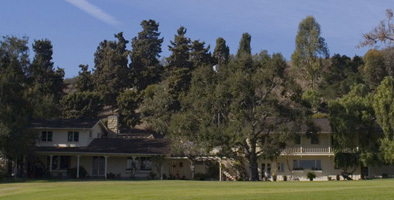 Students will learn about Will Rogers’ Ranch House, as well as Will Rogers’ life, family and ranch history. These tours are on Wednesdays at 10:00 a.m. (Maximum of 60 students for this program.) 1 hour duration. An exciting new Horse Interpretive Program is available by reservation for school groups in grades K-12. This program is designed to acquaint school children with horses and the work cowboys achieved with them. Volunteers, such as Brad Langenberg and his horse, pictured above, will show students how to handle horses safely, identify the parts of the horse and its saddle and bridle, and talk about the important role of horses in Will Roger’s life as a cowboy. Students will learn about horse shoeing and have an opportunity to pet a gentle horse. Please allow 30 minutes for this program. 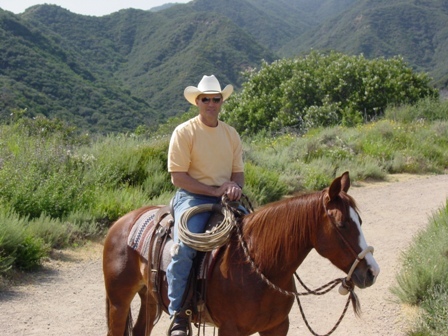 Program is subject to availability of our volunteer cowboy. Students will have the opportunity to use leather making tools to make bookmarks and bracelets which they will be allowed to take home with them. Please note that the leathercraft activity requires $50.00 materials fee for this program. (30 maximum students for this program.) Approximately 1 hour duration. A hands-on steer head roping program is available upon request. (30 maximum students for this program.) Approximately 1 hour duration. Teachers are encouraged to develop and conduct their own program tailored to their students needs depending on their particular school curriculums. This program time is completely self-guided and does not include park staff involvement or participation, but staff would be glad to discuss possible activities during the reservation process. For more information or to make reservations regarding these program, please contact the Park Interpreter at (310) 454-8212 x 103.